Pudding recipes tend to call for whole milk, which yields the proper thick/creamy texture, but I never have the stuff on hand – I’m a 1% kind of girl. To avoid buying a carton just for the pudding, I use a trick that I came up with during the dairy lectures of my Food Science curriculum in grad school. See, for the pudding’s topping I’m already buying whipping cream, which is ~35% fat. Since whole milk is 4% fat, I can calculate how much whipping cream to substitute into a cup of 1% milk to create a solution with 4% fat, just like whole milk. Using my science lab nerd skills, [C3=(C1V1+C2V2)/(V1+V2) for the win!] I can tell you that about 1.5 tablespoons of whipping cream in a cup of 1% or skim milk will give you a perfect substitute for whole milk. Of course, after establishing this guideline, I take liberty with it in my recipe development. In this case, to substitute two cups of whole milk, I used 1.75 cups of milk and only 2 tablespoons of cream – for my tastes, it was totally rich enough and didn’t need the extra fat. I also replaced one cup of milk from my baseline recipe with a cup of almond milk, to push for a fuller almond flavor. I’d like to experiment with using all almond milk in place of dairy, but this time I didn’t want to risk screwing it up and having no dessert for the big night. This pudding is some potent stuff; it’s the kind of intensely flavored dessert that will satisfy with just a small portion. The recipe makes quite a bit, 8 servings, so you can cut in half if you wish. Or just do like us and extend your Valentine’s celebration for the rest of the week. Love takes some time to properly celebrate! In a medium saucepan, combine the cornstarch, sugar and salt. Place over medium-low heat and whisk in the milk, 2 tbsp. whipping cream and almond milk. Continue to cook, whisking frequently, until the mixture is able to coat the back of a spoon - this should happen when the pudding is about to reach a simmer. At this point, whisk in the bittersweet and unsweetened chocolate, and continue cooking until mostly thickened (the pudding will become thicker when it cools), about 3-5 minutes longer. Remove the pot from the heat, and whisk in the almond extract and espresso powder, if using. 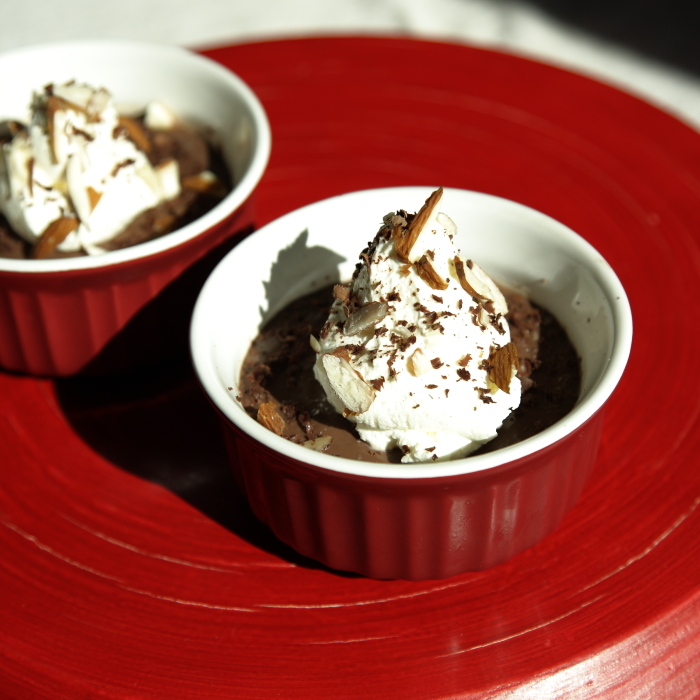 The pudding can be transferred into single-serving bowls to set, if desired. Refrigerate until cool and thickened, preferably at least two hours. Before serving, whip the cream in an electric mixer at high speed until soft peaks form. Add the powdered sugar and continue to whip to desired texture. 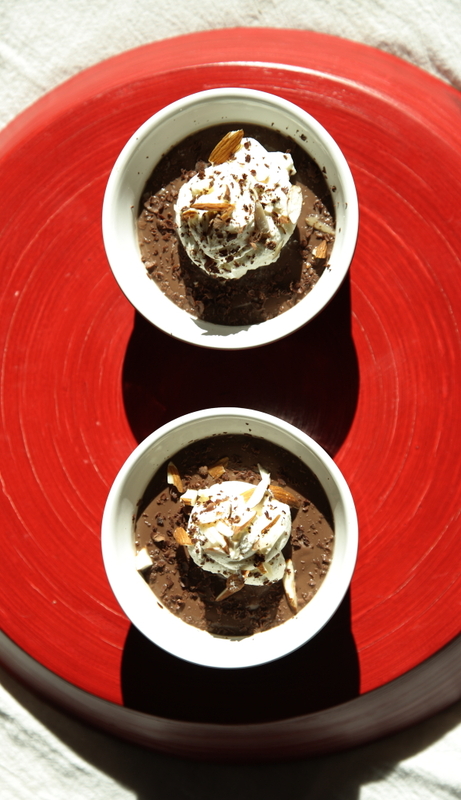 Serve the pudding chilled, topped with whipped cream, almonds, and dark chocolate shavings. I love your science nerd math calculation! It’s totally something that I’d do too! Haha thanks! After too many years in a lab, the habits follow us to the real world!